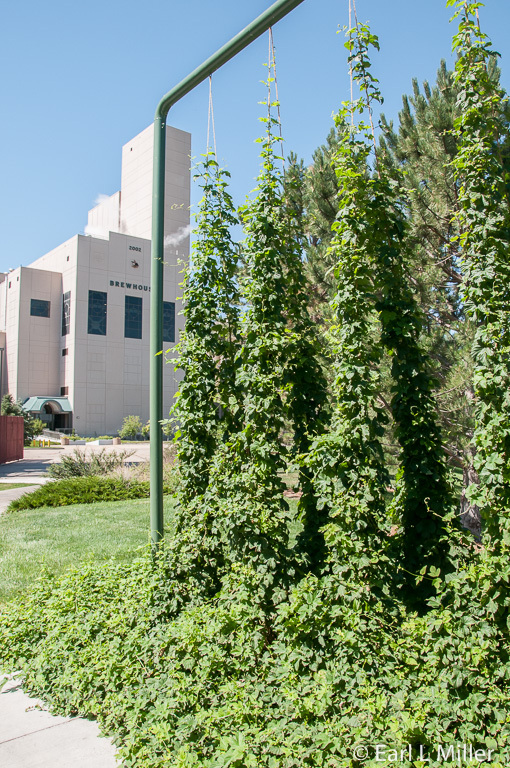 Anheuser-Busch has long been noted as the top attraction of Fort Collins. Perhaps, it is because of the interest in Budweiser Clydesdales combined with the fascination of the brewing process and the opportunity to taste quality beer. On April 7, 1933, August A. Busch, Jr. and Adolphus Busch III surprised their father with the gift of a six-horse Clydesdale hitch to commemorate the repeal of prohibition. Ever since, Clydesdales have played an important part with this company. The forerunner of the Clydesdale breed was the Flemish Great Horse. Bred first in Scotland, along the Clydes River, Clydesdales were first brought to the United States by Canadians during the mid 1800's. These horses lived on farms. Now they are primarily used for breeding and shows. The Budweiser Clydesdales that Anheuser-Busch uses must meet certain standards. They are all geldings, neutered males. They must stand eighteen hands at the shoulder (72 inches) and weigh 1800 to 2300 pounds. All their horses are bay in color with four white stocking feet, blaze white on their face, and a black mane and tail. Each set of Budweiser Clydesdale harnesses weighs 130 pounds and is valued at more than $64,000.They are handcrafted of brass and leather with stitching composed of linen thread. Harnesses can fit any of these equines, but collars are different since they must fit individual horses. Horseshoes weigh 5 pounds and are more than 20 inches from end to end. They are more than twice as long and five times heavier than those worn by riding horses. 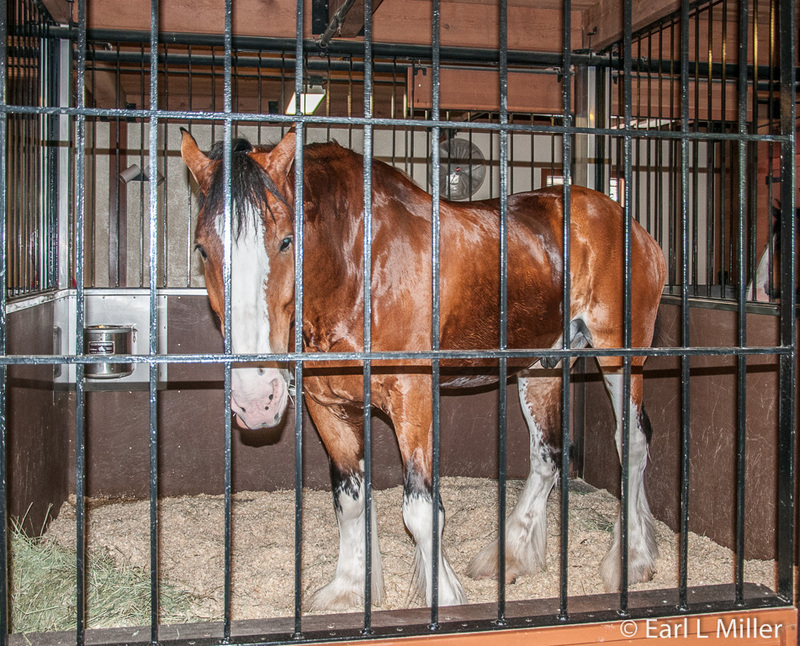 All Budweiser Clydesdales have their horseshoes reset every five weeks. Dalmatians have traveled with the hitch since the 1950's. These dogs were used for two reasons. They have a light coat, so they could be seen, and speed. The horses are hitched to red, white, and gold 1903 Studebaker built wagons. Anheuser-Busch keeps Budweiser Clydesdales in three places to cut down on their traveling. These are Fort Collins; Merrimack, New Jersey; and St. Louis. While there are ten horses on each team, only eight perform at one time. Usually they are home thirty days out of the year. They serve on the team, starting at ages four to seven, for ten years. They retire at ages 14 to 17 to Grant’s Farm, Missouri. Currently, 35 to 40 horses are in retirement. 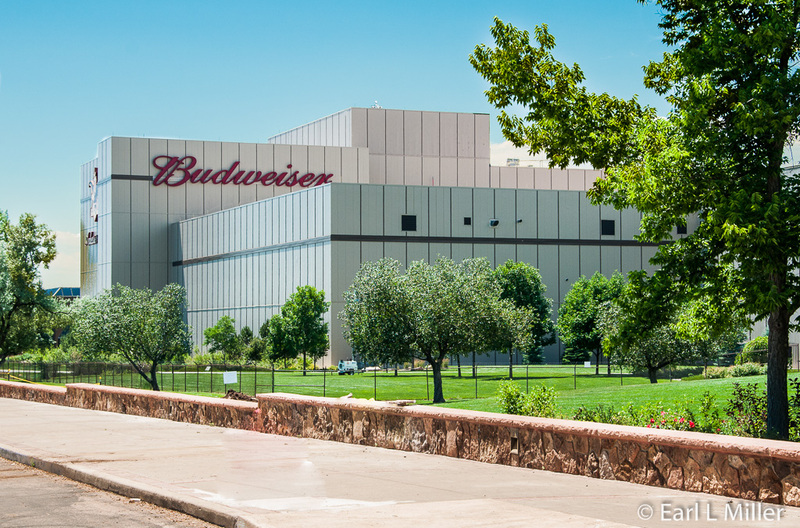 While many think all of the Anheuser-Busch plants provide tours, only five of the twelve plants in the United States do. Built in 1988, with an expansion in 2002, Fort Collins is one of them. 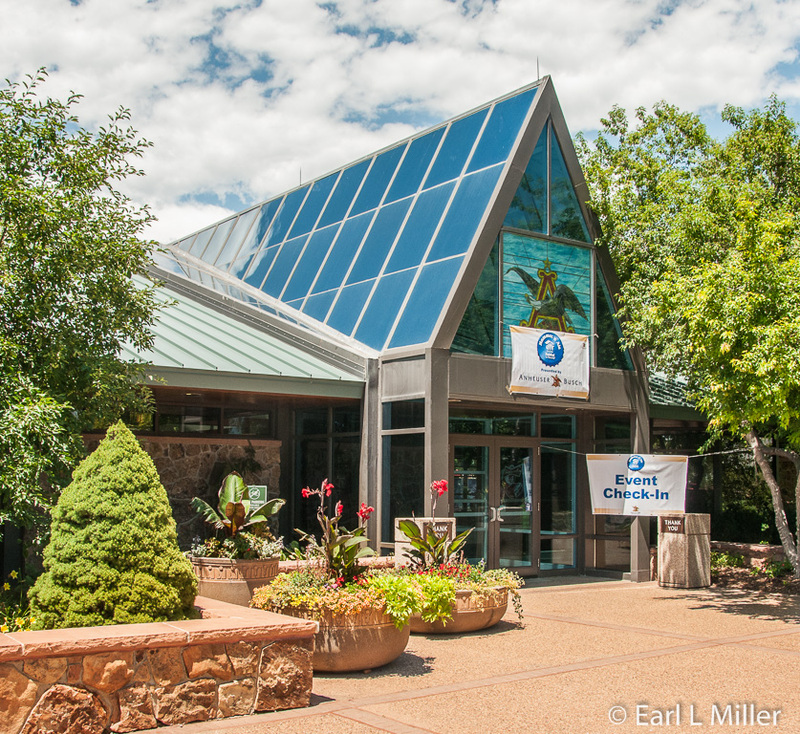 It’s the third largest plant and offers two types of visits. 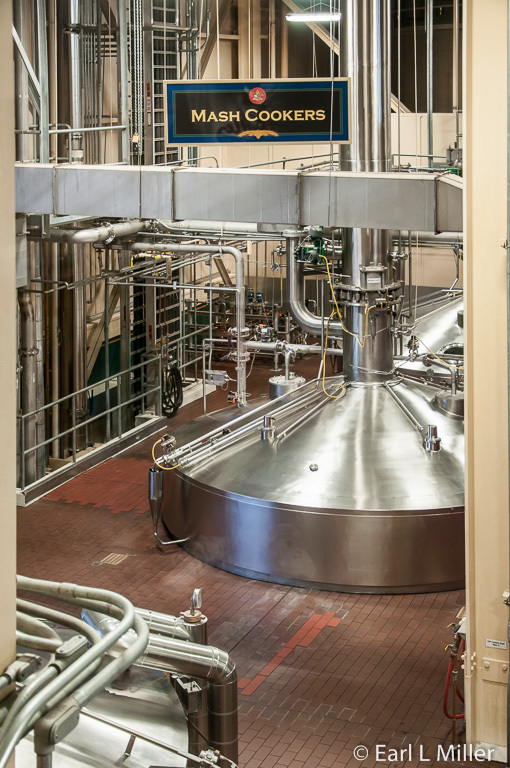 The complimentary tour guides you through the brewing process with visits to the Brew House and Packaging Facility. At the end of your tour, you receive two glasses of beer. The tour lasts an hour and 15 minutes. The two-hour Beermaster Tour is $25 per person. It is necessary to make reservations in advance, by calling (970) 490-4691, since each tour is limited to ten people. This tour allows you to go on the floor and see the machinery up close. 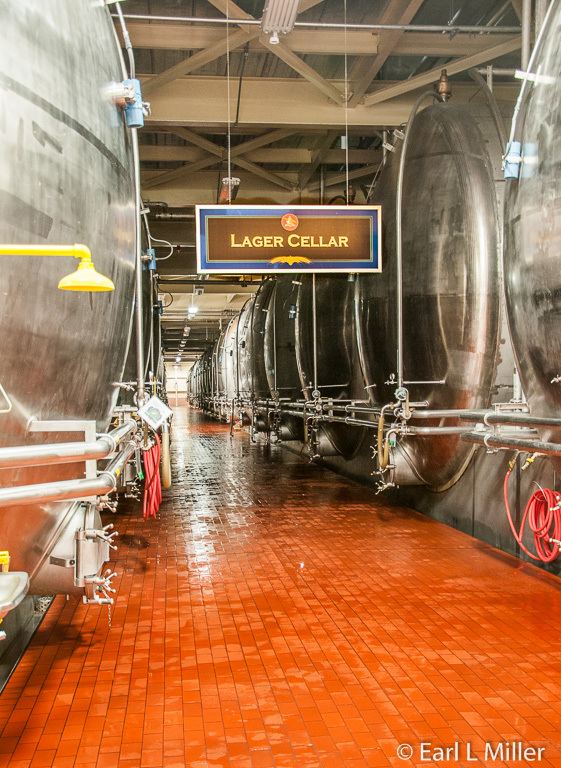 It includes visits to the Brew House, Starting Cellar, Quality Assurance, Packaging Facility, Lager Cellar, and Budweiser Clydesdale Hamlet. It concludes with product sampling. Closed toe shoes and long pants are mandatory. Both tours leave from the Budweiser Clydesdale Stables giving fortunate visitors an opportunity to see these massive horses. Sometimes the horses won’t be present since they’ll be at one of their many events. We found four of them, including one named PeeWee, in the pasture and later in the stables. Take time to read the exhibits about the Budweiser Clydesdales and their harnesses at the end of the stalls. We had our tour guide, Kevin, call for a golf cart since we didn’t feel like walking a half mile from the stables to the plant. After catching up with our guide, who walked a group over, we learned about the company’s history and seven steps of the brewing process through his explanation and a video. 1. Milling- This is where barley malt and rice are ground and precisely weighed. We learned while lots of companies don’t use rice, Anheuser-Busch does since this grain provides a crisper body and better taste to beer. 2. Mashing - Barley malt and rice are mixed with water obtained from a local source. Natural malt enzymes now break down the starch from the grains into fermentable sugar. 3. Straining - The combined grain mash is strained leaving a sugar rich, amber liquid called wort. 4. Brew Kettle - Hops are added to the boiling wort in huge brew kettles. They add special flavor, aroma, and character to the brew. Anheuser-Busch is the only brewery with its own hops fields. 5. Primary Fermentation - Wort is cooked and clarified. Then yeast is added. The yeast ferments the wort to beer in six days by producing carbon dioxide and alcohol. We learned the original yeast culture was used by Anheuser-Busch in 1876. 6. Beechwood Aging - During lagering, the beer is naturally carbonated. It’s aged on beechwood chips from Tennessee for 21 days to mature the beer’s flavor. Anheuser-Busch is the only major manufacturer worldwide using beechwood chips. Beechwood provides more surface for yeast’s action. You will get to see what these tanks and wood look like. 7. Finishing - Brewers must remove yeast and some unstable protein to keep the lagered beer flavor and its clarity intact after packaging. 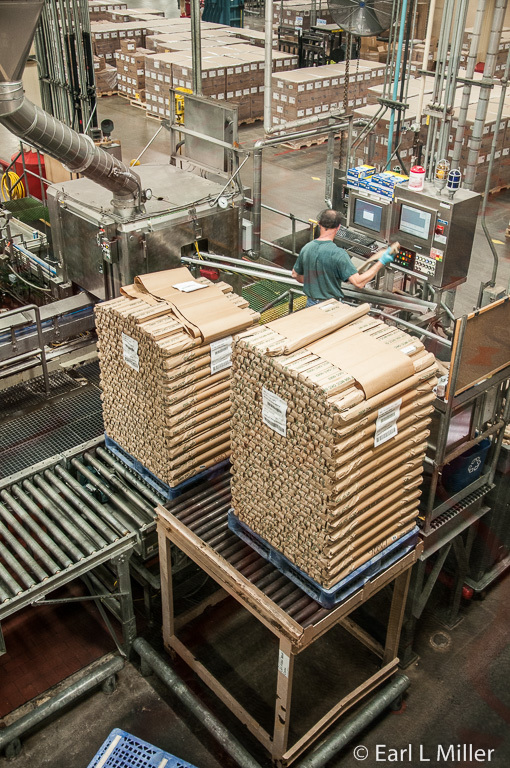 The beer sits for 24 hours before being released for packaging into bottles, cans, and kegs. 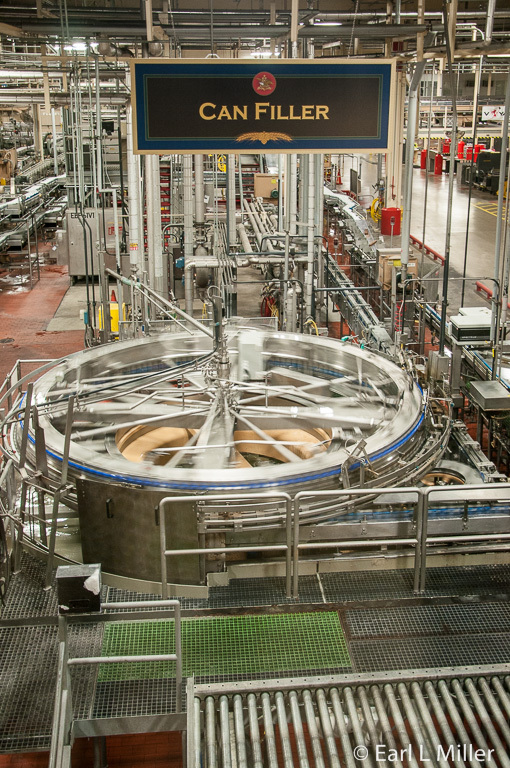 The tour also touches on other aspects at Anheuser-Busch - the company’s environmental efforts. They have reduced the use of water 40% in the last five years and recycle waste beer and cardboard. The company contributes financially to community charities. The day we were there they were hosting a party for Habitat to Humanity. You’ll learn about packaging and shipping, view containers of their various products, and see examples of their written advertisements from the 1950's to the present. You’ll see a display on the can tops they have used and information about their various breweries as you walk the halls. Your guide will also tell you about the Budweiser Clydesdales. In short, even the complimentary tour is very informative. Hours are June to September daily 10 a.m. to 4 p.m. October to May, it’s the same hours but Thursday to Monday. To add to their guest’s pleasure, the Fort Collins plant is building a new Beirgarten, expected to open in October 2014. It will pair food and all kinds of beer. You’ll find the plant at 2351 Busch Drive. Trainers name the Budweiser Clydesdales. The first letter of the colt’s name is usually the first letter of it’s mother’s name.